Missouri state senators will be busy this week in Jefferson City, tackling the state budget. The Senate Appropriations Committee, which is chaired by State Sen. Dan Hegeman, R-Cosby, is scheduled to meet Tuesday morning and every morning through Friday to discuss the budget. The Missouri House voted in late March to approve a $29.2 billion state operating budget, which includes a $100 million transportation infrastructure plan. 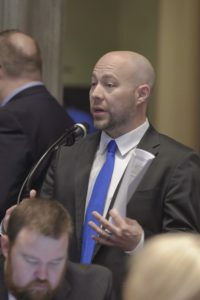 House Budget Committee Chairman Cody Smith, R-Carthage, says it’s the first time in recent history that general revenue would be used to fund roads and bridges. The House’s budget also includes an $8 million retention pay plan aimed at wage increases for Missouri Department of Corrections (DOC) staff. Governor Mike Parson has said the DOC’s 11,000 employees are among the nation’s lowest-paid corrections professionals. Under the House budget, DOC employees would receive the three percent pay increase all state workers would get. They would also receive a one percent increase for every two years of continuous DOC employment, up to 20 years. Once the Senate approves their budget version, a bipartisan conference committee will then be appointed to negotiate any differences between the two chambers. The state Constitution requires lawmakers to approve a balanced budget by early May.